I envy people who have no debt. I want to be like them. I really do. I have the skills, I have the desire, yet it seems like a goal floating in the wind. I can see it. And almost touch it but it keeps floating away from my grasp. And I know why. I’ve made some poor choices over the years and now I’m paying for them. I’ve welcomed debt into my life and it’s rooted itself like that bad roommate that just won’t leave although you’ve grown weary of him or her. During one of our “Dealing with Debt” segments on news 95.7, we were discussing the merits of living without credit. And I readily agreed that it is a liberating place to be. I know because those I have helped get out of debt have told me. :). Inside I long to be one of those people – living without credit. Oh I’ve made some progress over the years, but unsteady income, child care and investments in my education have all ensured I don’t get too far away from debt. Not yet anyway. But I’m nothing if not persistent! The process is simple. It’s actually doing it that is the difficult part. Sounds easy, right? Unfortunately many things can get in the way – a reliance on credit to live beyond our means, a drop in or loss of income, and a lack of planning/attention to name a few. To begin, start tracking your spending. And I mean every cent you spend. Figure out what your habits are and then decide which ones to break or change. In order to be truly successful, you need to stop relying on credit to supplement your income. It’s ok to use credit, as long as you pay it off each pay period. There are some great calculators online that will assist you in calculating how long it will take you pay off your current debt. Start small as you begin the process of changing your habits. 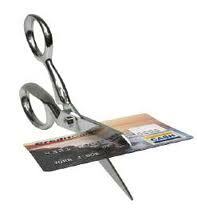 Pay some amount over the minimum payment so you begin to reduce your debt. As you learn more about your habits and begin changing them, you can start redirecting more money to debt repayment. We tend to rely on credit to cover those unexpected, or worse yet ‘expected’ expenses. You know the ones I am talking about – car repairs, Christmas, kids activities, home maintenance costs. A spending plan will not be successful if you do not start planning for these types of expenses. Figure out how much you need to cover these expenses in a year, divide by twelve, and commit to setting aside this amount per month. The account may not alleviate all of your need for borrowing immediately, but you will be heading in the right direction. You have developed the habits you have over many years, don’t expect them to change over night. Change takes time, and patience. A good plan is one you start to follow, find the faults in, tweak as you go along and continue to commit to. You will have setbacks. Get up, dust yourself off and try try again. It’s a New Year. Time to reflect on what works and what doesn’t. Out with the old and in with the new. Stay tuned for more tips as the year progresses.